Shakespeare's play is transferred to the futuristic urban backdrop of Verona Beach, California. The Montague and Capulet families are embroiled in a long-running feud. 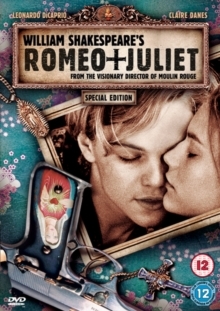 When Romeo (Leonardo DiCaprio), a Montague, attends a Capulet ball in disguise, he falls in love with the beautiful Juliet (Claire Danes). Although already engaged to Dave Paris, whom she does not love, Juliet vows to marry Romeo. They ask the kindly Father Laurence to perform the ceremony in secret, but bloodshed and tragedy threaten the couple's future together. Commentary: Baz Lurmann (director), Catherine Martin (designer), Don McAlpine (cinematographer) and Craig Pearce (writer). Bonus Tracks: 'Young Hearts Run Free' music video by Kym Mazelle and 'Kissing You' music video by Des'ree.